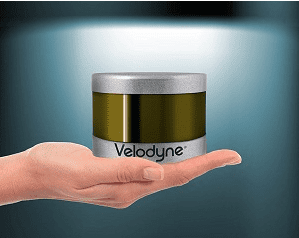 In a bid to dramatically expand the use of 3D LiDAR sensors in robotics, unmanned aerial vehicles and automation applications, Velodyne’s LiDAR Division today unveiled the Velodyne LiDAR Puck, dubbed the VLP-16. The new 16-channel real-time LiDAR sensor is both substantially smaller and – with an introductory price of $7,999 — significantly less expensive than previous generation sensors. Measuring 3D in real time, the VLP-16 is part of a growing family of solutions built around the company’s Light Detection and Ranging (LiDAR) technology and immediately establishes a new standard for affordability. Being able to measure three dimensions in real-time at this price level represents a quantum leap for the technology and places Velodyne ahead of any other LiDAR solution provider, according to David Hall, Velodyne founder and CEO. The introduction of Velodyne’s LiDAR Puck is yet another major step in the evolution of LiDAR technology. During DARPA Grand Challenges in 2004 and 2005, Velodyne’s HDL-64E high-resolution sensor revolutionized the world of environmental 3D perception and has since become the sensor for self-driving cars. In 2010, the company introduced the smaller, lighter-weight model HDL-32E, which is now the de facto standard for major location providers as they map the globe. Founded in 1983 and based in California’s Silicon Valley, Velodyne Acoustics, Inc. is a diversified technology company known worldwide for its high-performance audio equipment and real-time LiDAR sensors. The company’s LiDAR division evolved after founder and inventor David Hall competed in the 2004-05 DARPA Grand Challenge using stereovision technology. Based on his experience during this challenge, Hall recognized the limitations of stereovision and developed the HDL64 high-resolution LiDAR sensor. More recently, Velodyne has released its smaller, lightweight HDL‑32E sensor, available for many applications including UAVs. Since 2007, Velodyne’s LiDAR division has emerged as a leading developer, manufacturer and supplier of real-time LiDAR sensor technology used in a variety of commercial applications including autonomous vehicles, vehicle safety systems, 3D mobile mapping, 3D aerial mapping and security. For more information, visit www.velodynelidar.com. For the latest information on new products and to receive Velodyne’s newsletter, register here.